Jimmy Goldsmith, Courtesy Di Christenson. James Herbert arrived at Point Henry, Corio Bay, Geelong, Victoria in January 1853, on the Six Sisters (Zes Gezusters). James was married to Ann, and they sailed to Australia with their children Samuel 10, James 7 and Mary Abigail 5. After some time in Geelong, the family travelled to the diggings at Ballarat. James Goldsmith signed the Bendigo Goldfields Petition. At the time of the Eureka Stockade uprising the Goldsmith family were at Bakery Hill, where James placed his daughter, Mary Goldsmith, down a mine shaft for safety. According to some accounts James Goldsmith may have been the first to fire a shot at the Eureka Stockade on 03 December 1854, although others credit the first shot to Harry De Longville. Captain Henry Wise was killed during the Eureka Stockade and James Goldsmith reportedly took his sword after the battle. Later Goldsmith and Bentley started a saw mill together at Springs Road. The sword was said to be Italian, which is possible as Wise was born in Rome. Goldsmith gave the sword to Bentley sometime before his death. Bently went to live at Wattle Flat, but kept in touch with his late friend’s daughter Mary, and before Bentley died gave the sword to Mary's husband Thomas Henry Barnett. Later the sword was given to the Ballarat Fine Art Gallery where it hung on the wall over the staircase for many years. The sword was later secured for the Ballarat Historical Museum where it remained until the Museum closed in 1953, and the exhibits moved to the new Historical Museum at Sovereign Hill. 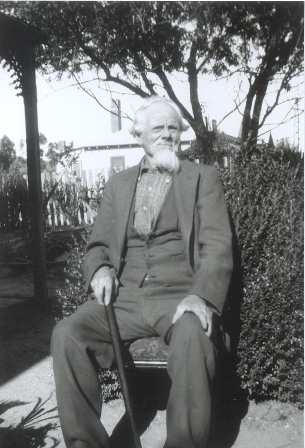 On Thursday there occurred at Wattle Flat, the death of one of the oldest residents of the district, in the person of Mr Samuel Thomas Goldsmith, after a short illness. The deceased was born in London in 1841, and at the age of 10 years left, with his parents, for Australia, arriving at Geelong. After a short stay there the goldfields of Ballarat attracted the attention of the deceased's father, who was at the Eureka riots. The deceased was at one time living at Bakery Hill, with his mother, brothers and sisters. After residing at Ballarat for a short time, the late Mr S. Goldsmith left, with his father, and was engaged in a saw milling plant for many years in the Wattle Flat district, after which he turned his attention to farming and mining interests, and up till the time of his death had resided in the district for 60 years.The deceased leaves a widow, six sons and three daughters, and also a brother and sister, Mr James Goldsmith, of Brown Hill, and Mrs T. Barnett, of Bond street, Ballarat East. The funeral took place on Saturday, and was largely attended. The remains were removed from his late residence and interred in the Ballarat New Cemetery. The coffin-bearers were Messrs James Goldsmith, George Goldsmith, Samuel Goldsmith and J. H. Goldsmith. The pall-hearers were Messrs W. T. Pearse, J Keith, M. Samson, T. Walpole, A. Walpole, W. Fraser, P. Pearse, T. Barnett, senr., C. Barnett. H. Barnett, T. Barnett, junr., S. Goldsmith, T. Calistro, G. Calistro and J.Gunn. The Rev.Canon Colebrook, officiated at the grave. When Capt Wise was killed, Goldsmith took his sword. Later Goldsmith and Bentley started a saw mill at Springs Road. Prior to his death Goldsmith gave the sword to Bentley who went to live at Wattle Flat. He kept in contact with his late friend's daughter and before he died gave the sword to her husband Thomas Henry Barnett. Later it was given to the Ballarat Art Gallery where it hung on  wall over the staircase for many years. The sword was later secured for the Ballarat historical Museum where it remained until the Museum closed in 1853, and the exhibits moved to the new Historical Museum at Sovereign Hill. ↑ Albury Banner and Wodonga Express, 9 November 1906. ↑ Creswick Advertiser, 22 February 1916. ↑ Notes from Hazel Williams.